Mein neues Modell von Zara ist cool, hat einen leichten Oversized Schnitt und Golddetails. Zu der Jacke trage ich eine Bikerjeans, weißes Shirt und weiße Converse Sneaker. Passend zum Streetstyle Look habe ich von meiner Schwester eine Flechtfrisur verpasst bekommen. Bekommt ihr ebenfalls nicht genug von Bomberjacken? Cool look! Love the bomber jacket! 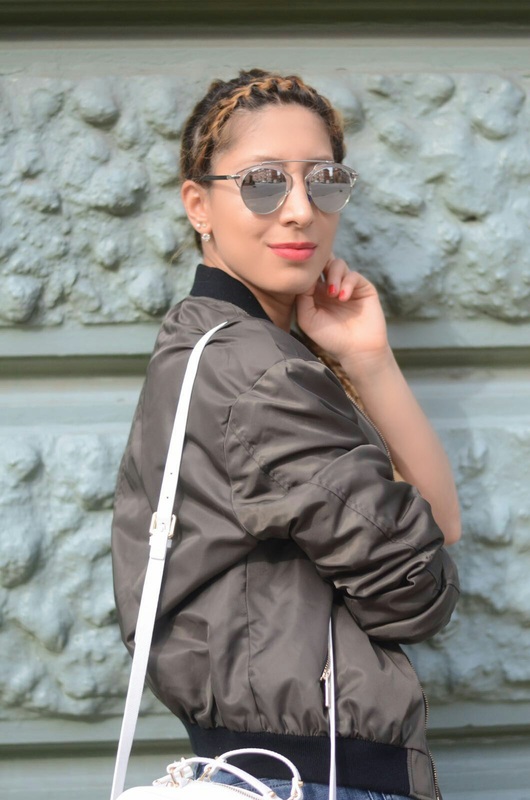 Your hair looks so stylish worn in this way and the bomber is everything – great look on you! Love your jacket! Cool look! I absolutely LOVE the look of this Khaki bomber jacket! You looks gorgeous!! Love your jacket! Loving this look, it’s so effortlessly cool! Obsessed with your hair and your bomber jacket is so cool, babe! Just want to say hello doll. Love you style! Happy Wednesday! Preciosa la cazadora de esta semana la trenza te queda genial.un beso guapa. Loving the khaki bomber jacket! Amazing style! Love your outfit and your hair!! Such a cute and casual look. I love your hair too!! Your style is amazing! Love. Superb Stil, Du bist sehr schön! Really love this look on you and really love your hair!!! In this khaki you look just stunning and pretty. lovely look. and love this style. So cute and I am obsessed with your hair! Perfect style!!! Your hair style is amazing!! ❤ Great post beauty! Liebe Pisa, ich bin verliebt in deine Bomberjacke ❤ Und du bist so schön, meine Liebe!